We’d love your help. Let us know what’s wrong with this preview of The Experiment by Diane Hoh. Caryl Amberly is thrilled when she is selected to participate in Professor Maximillian Delure's new seminar until she learns of his reputation as a scientist, poet--and killer. I love 90's teen horror books. How could you not? They're so different to more modern horror books as they actually give you chills. I had chills throughout this book. I really liked Caryl, I thought she was a decent charity for this being such a short little book. I think Diane Hoh and RL Stine are the quintessential Point Horror writers. I have Source: I own this book. How could you not? They're so different to more modern horror books as they actually give you chills. I had chills throughout this book. I really liked Caryl, I thought she was a decent charity for this being such a short little book. I think Diane Hoh and RL Stine are the quintessential Point Horror writers. I have such love for this genre and I can't wait to revisit it and review them all. This one definitely had a very interesting plot, I found Professor DeLure very very creepy. This is the first book in this series that I've read, but I bought a whole stack of them yesterday and I am not disappointed! 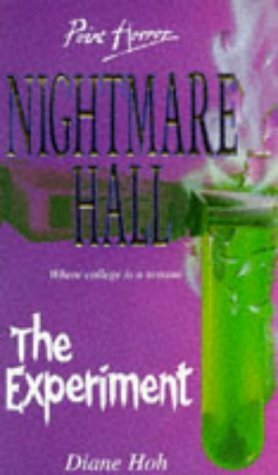 These teen horror stories from the early 90's deliver exactly what they promise..chills and thrills. Paced well, suspenseful and an ending you don't see coming, can't wait to read the rest of these! This was not one of diane's better tales for sure. The heroine was wretched and it had spiders or should I say tarantulas as a antagonist!!! I hate bugs!!!! On that standard alone I would not recommend this to anyone. This review has been hidden because it contains spoilers. To view it, click here. Anna really isn't that good of friend. I mean have your moment of mad and then listen to your friend.